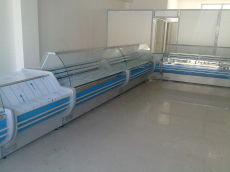 Refrigerated showcase "Donna". 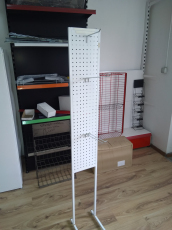 Horizontal cooling display case with range of 0 to 4 degrees. Suitable for meat shops, grocery stores and supermarkets. 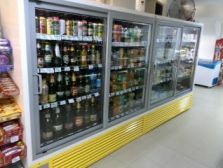 Vertical refrigerated showcase, cooling with sliding doors, LED illumination, remote unit. Suitable for packaged cheeses, milk, soft drinks, beer and juices. The most commonly used refrigerators for food. Under the exhibition area has refrigerating cabinet. Suitable for ready meals in gastronorm containers. Made in two types - dry and type "Ben Marie". Gastronorm containers are ordered further, according to customer needs.